Garlicky Leeks with Bell Pepper and Onion Mashed Potatoes. Today I was craving mashed potatoes which I rarely cook for just my party of one. I departed from my standard potatoes that I make for holiday dinners, and decided today I wanted to add a little crunch and texture. I had about a dozen small and medium Red Russet potatoes which were overly ripe and sprouted, but still okay to cook. Had they sat around a few more days without being cooked, they would have turned soft and the starch would have converted to sugars. Since they were still firm, I tore off the sprouts, washed and peeled, and cubed the potatoes. While boiling the potatoes, I had ample time to prep the rest of my dish. As I’m in desperate need of grocery shopping, I wanted to use up the last of my produce. I had on hand some leeks, green bell peppers, and a yellow onion. First step was to peel, cube, and boil the potatoes. While that was boiling, I finely chopped one bell pepper and some onion. In my saute pan, I heated up olive oil, garlic, and seasoning with 1/2 cup onion. Once the onion was translucent, I added in the bell pepper and turned down the heat. I kept stirring periodically. This bell pepper and onion mix was set aside to be added to my mashed potatoes to add texture and crunch. Meanwhile, the potatoes had finished cooking. I drained them and then seasoned them in a bowl with Brummel and Brown’s natural yogurt (tastes like butter but better for you!) and garlic and almond milk. I use non-flavored unsweetened almond milk. Added in the peppers and onions for flavor. The leeks were simply sauteed with with olive oil, lemon juice, garlic, Cavenders, and ground ginger. This made for a nice hearty vegetarian dinner full of flavor and texture. 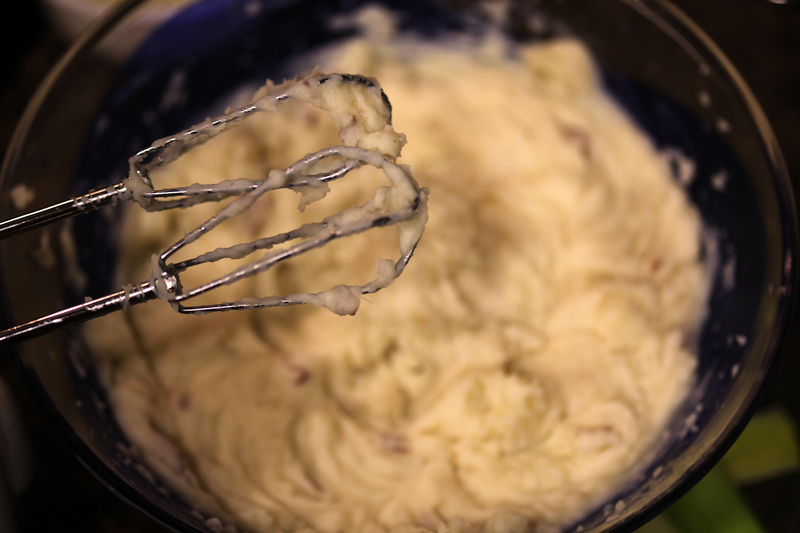 The lemon added a nice touch of acidity, the peppers and onions added a caramelized texture to the mashed potatoes. Total cooking time, 40 minutes including 10 minutes of prep. Calories, approx. 430 per serving. ← Avocado and Leeks Breakfast Taco.